Why choose CEO? CEO has 8 core advantages to make more profits for you. 3. What’s the comments of customers after receiving the CEO? Now I will explain with easier way to show you how to solve these problems. As a beginner, if you always fails in edge screen refurbish, what can you do to reduce the risk of fail? Specially, our R&D find that in-frame lamination can increase the success rate. It’s well ahead of the curve actually. It’s no need to separate mid-frame, which makes it more easier for operation and reduce the risk of breaking the LCD. We use special mat to do in-frame lamination with 0 risk and high success rate, it’s suitable for beginner to use and operate. After using lamination machine for a while, do you find that there are always returned bubble and take long time to debubble edge screen? I think the reason why it’s take long time to debubble is that the mat cannot accord with the glass radians completely. Which is leading to severity deformation of OCA glue in the laminating process, so more pressure and longer time are needed for laminating. Because the debubble process using high pressure and takes a long time, the possibility of returned bubbles increases. 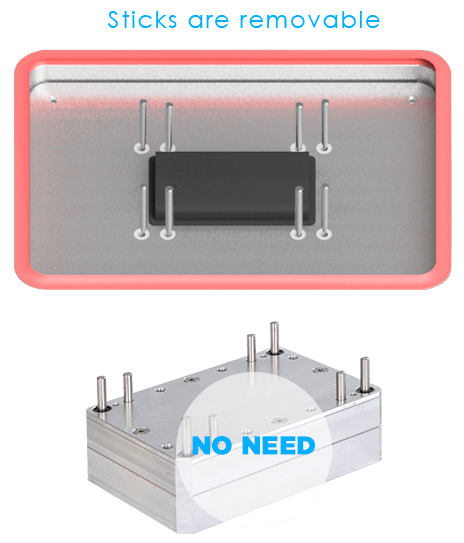 In order to solve these problems thoroughly, we designed the mold and mat specially for the CEO machine. It can laminate the edge screen almost with bubble-free, and the bubble removal time only need 2 minutes. And only need 4kg/cm² bubble removal pressure. If you do like that, your LCD can achieve 0 returned bubble. It can improve your refurbish efficiency and reduce cost. Always result in dead bubbles (bubble that cannot be removed), causing rework? From the feedback of many novice customers, we know that when they are fitted with the Flat lcd of the MI series and the Samsung series, they are prone to dead bubbles and cannot be removed, resulting in the need to re-separate and fit again. Seriously reduced work efficiency. From the analysis of more than 100 cases, we came to a conclusion. If there is a dead bubble in the fit, the problem must come from the bad operation of manually attaching OCA. Because the push wheel operation is used, it is difficult for the novice to control the force, and it is easy to deform the OCA, thereby generating a dead bubble. 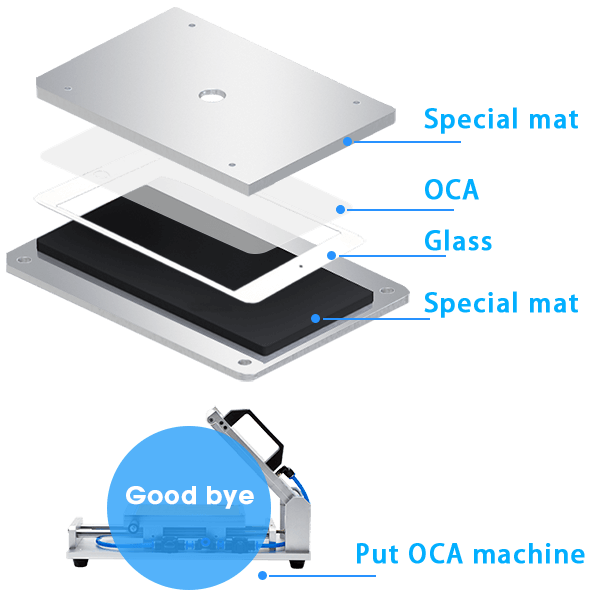 Therefore, we have developed this mold, firstly we need to do vacuum extraction and then slowly press down vertically to ensure that the OCA fit does not deform, no bubbles. Therefore, the LCD&OLED does not require rework, which greatly improves the work efficiency. Another trouble also found that there is no single machine on the market that can meet all your needs? Yes, now there is not exist a machine to solve all broken screens on the market. Some machines can solve the problem of edge screen, but it can't solve the problem of large-size LCD and ipad. Some machines can refurbish large-size screens, but they can't solve the problem of edge screen. The CEO machine can refurbish edge screen and 0-12.9 inch flat screen, one machine can meet the needs of all models of the screen. No need to buy extra machine. If you are interested in knowing the feedback of our customers, I can show you pictures. If you are still confused about this article, you can contact me whatsapp: +8613826121144.